It has taken me a long time to come to this point. But it is clear that some company leaders and CMOs cannot think three dimensionally. Why is this dangerous? If you can only see one step ahead or backward, then you will loose. Most of you probably remember the old Star Trek television series in the late 60s. The genius, Mr. Spark, used to play three-dimensional chess. Here he was, a genius who trained his mind to think beyond single board chess. He visualized complex chess moves on a single board made many times more complex as each move impacted two other chess boards simultaneously. If Spark could only anticipate an oponent's move on a single board, then he would loose the game. In the same way, today's marketer must move beyond two-dimensional thinking and look at the interconnectivity of all marketing initiatives. The graphic below symbolizes marketing as a whole. 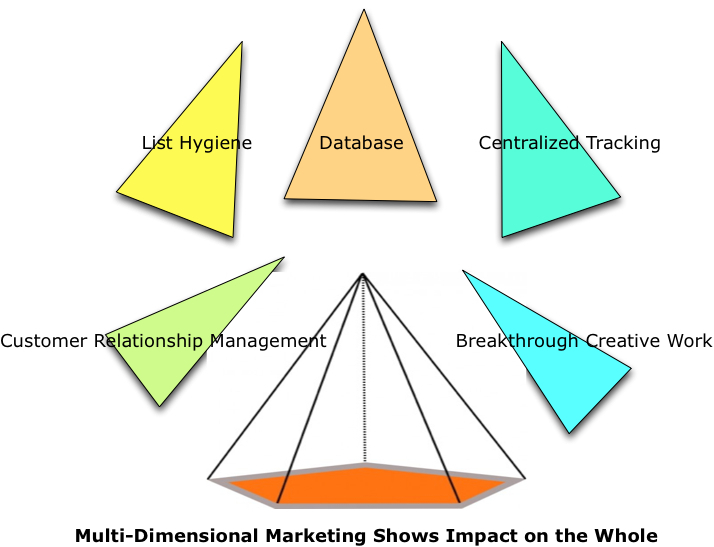 For simplicity, the visual displays only a few marketing activities and how they interconnect to form the whole as a three-dimensional pyramid. Let's think about how these few activities interrelate. For example, the graphic shows CRM as a key activity. But CRM requires a robust database that automates all prospect and customer contacts such as email, direct mail, phone follow up and so forth. So an incomplete or inaccurate database adversely affects the results of CRM. At the same time, a decentralized tracking system that fails to record all customer and lead activity on the database emasculates back end marketing evaluation and CRM initiatives. And breakthrough creative work dies because a decentralized tracking system fails to identify the cost per lead, cost per sales or cost per customer numbers that identify great or failed creative executions. Even a strong database with good tracking looses steam if the lists are not cleaned prior to mailings for list enhancement, outbound telemarketing, email or direct mail activities. My take. Marketing requires a fluid mind that understands the interrelationships between marketing activities and how even one weak link will kill the most brilliant of marketing programs. Another take. Having worked with hundreds of marketers and marketing planners over the years, I have come to the conclusion that creativity and three-dimensional thinking separates strategists from tacticians. No amount of education or training creates a strategist. You either have the gift or you don't. Posted on February 27, 2012 by Ted Grigg and filed under Direct Marketing Strategy and tagged threedimensionalthinking.